So far as is known, the parish church at Atworth has been dedicated to St Michael from its beginning. The liturgy kept the 29th September as the day of St Michael the Archangel until the Reformation in the 16th century. This is the name that is still used in the Diocesan directory and in Faculties. The Book of Common Prayer commemorates St Michael and All Angels on 29th September, hence the name of St Michael and All Angels is sometimes applied to the church today. The new Roman liturgy also links 29th September with St Gabriel and St Raphael; however the view is that the patron of the church at Atworth is St Michael. There is evidence of the existence of churches on the site since Saxon times. In 1001 King Aethelred II granted the Abbess of Shaftsbury permission to build a chapel at Atworth. It was completed in about 1010 and is mentioned in the Doomsday Book of 1086. Subsequently, the nave was rebuilt, having been partially destroyed by fire between 1100 and 1200. The first vicar was Thomas de Muleton who was duly presented by the Lord of the Manor and Patron of Atworth Church, Richard Cotel of Cottles House, in 1298. In 1451 the church was rebuilt and enlarged in 1451 by Thomas Beaushin of Cottles House. The existing tower is all that remains of that building, which lasted nearly 400 years. 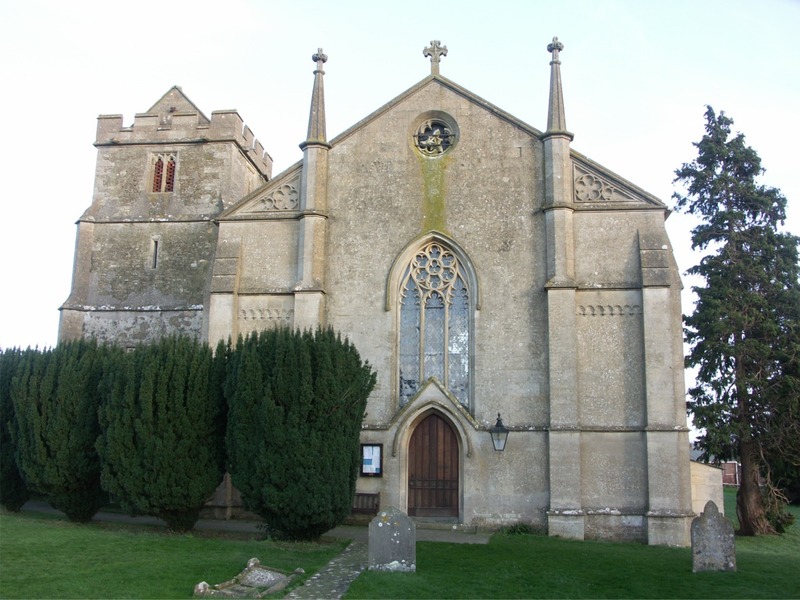 The simple embattled and saddleback design design of the tower was typical of 15th century churches built in small Wiltshire communities where financial resources were limited. Atworth at that time had a population of about 700. The only known authentic picture of the mediaeval church is the beautiful watercolour by John Buckler, painted between 1800 and 1810. The picture is now in the possession of the museum of the Wiltshire Archaeological and Natural History Society in Devizes. A good copy can be seen in the Atworth Museum in the barn of Popular Farm House, Bradford Road, Atworth. The Atworth museum is open from 2:00-4:00pm on the last Sunday afternoon of each month, except December. By 1831 the fabric of the old church was giving cause for alarm and it was decided to demolish all of it except the tower. The new building was designed by Mr RE Goodridge of Bath in early Gothic revival style. The cost was met largely by a grant from the Incorporated Society for Promoting the Enlargement, Building and Improving of Churches and Chapels. Seating was provided in the nave and gallery for 428 persons 263 of which were declared "free and unnapropriated forever". The present pews date from 1881 and were the work of Mr F Titt who ran a carpentry business on the site of the Village Institute. The church was duly opened in 1832. The building is chapel-like, and was in its early years often referred to as "the chapel". It is set a little to the south of the old tower, being joined to it by a short corridor leading into the vestry at the base of the tower. In the east wall of the upstairs chamber can be seen a stone archway which marks the connection with the mediaeval church. Today, entry to the tower is by the original door on the north side. The outline of the junction between the roof and the former nave and the tower is clearly visible on its east side. Removal of the nave exposed to the elements several of the tombs that had formerly lain there, including that of Mrs Jane Brown (nee Powlett), of Cottles House, who died in 1706. A bequest in her will, recorded in detail on her tombstone, made possible the first organised education in Atworth. Apart from the memorials, which are considered separately, a number of other items were transferred from the 15th century church. These included the stone font and the four tablets, two on each side of the altar, recording the Ten Commandments, the Lord's Prayer and the Apostles' Creed. The pulpit is mediaeval with richly canopied panels. It did not belong to the former church but was transferred from St Michael's, Melksham, probably following the reorganisation of the building in 1845. The stone altar is a memorial to Lady Kathleen Fuller given by the St John Ambulance Brigade in 1964 and its ornaments were a memorial gift from church members and other friends. It will be noted that the altar, which was originally against the east wall, is now a yard from it. A redesign of the sanctuary so as to conform more closely to the requirements of the modern liturgy took place in 1981, and is dedicated to Mrs Florence Griffiths, mother of the vicar. Besides its beauty and intricate artistry, the east window has considerable historic interest. It is a memorial to the widow of Major Sir John Fuller of Neston park, who, by her second marriage, became Mrs Norah Forestier-Walker. She lived at Cottles House, and was a great benefactress to Atworth. As the window records, she died on 22nd February 1935. The stained glass is the design of the late Hugh Easton whose name is in the bottom left hand corner, in the unusual form of a weather vane. His work enjoyed a high reputation and is widely represented throughout Britain, including in several cathedrals. One of his best known windows is that commemorating the Battle of Britain at the east end of Westminster Abbey. 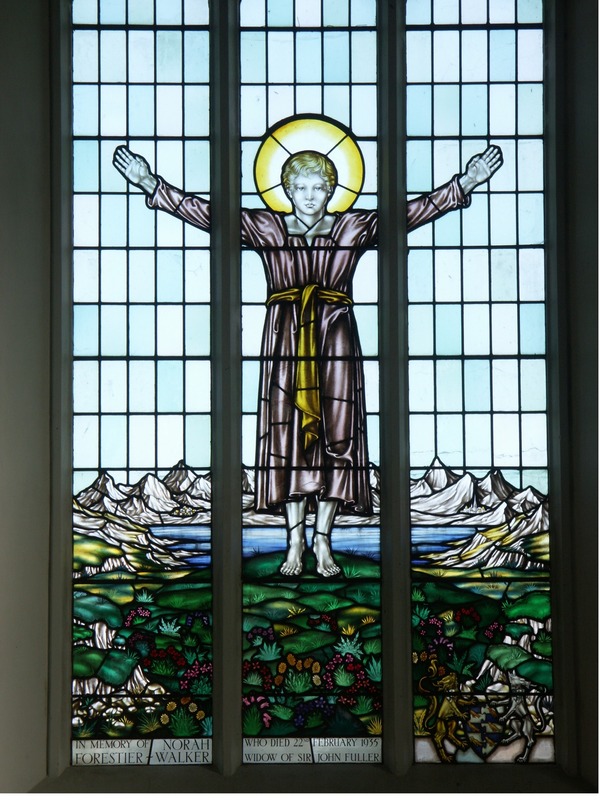 The peaceful Galilean setting of the Atworth window, with the little town and church, suggests a possible influence of Ann Macbeth's beautiful tapestry The Good Shepherd which hangs in Patterdale Church in Cumbria, depicting a somewhat similar background of surrounding hills. Whether Easton was ever aware of that tapestry remains conjecture. The coat of arms at the bottom right hand corner of the window is that of the Fuller family. The Atworth window is not unique: a duplicate, but without the coat of arms and with a different dedication is to be found in the church of St John the Evangelist, Curt, Surrey. Perhaps there are others. Originally the tower housed a ring of four bells. One was removed in 1533. The treble bell, dated 1350, is now, alas, cracked, and is without its clapper. It is inscribed Ave Maria and was cast in Bristol. It is the oldest object in the church, dating back to the Norman building. It is claimed that it is the most ancient bell in Wiltshire. The second bell was cast in 1786 by William Bilbie of Chewstoke, Somerset, to the memory of Guilliam Webb, a church warden. The tenor bell is dated 1606 and was made by Roger Purdue of Bristol and is inscribed Gloria in Excelsis Deo. Today, the condition of the tower would not permit the ringing of all three bells, and only the second and tenor are chimed before services. A single manual organ presented to the church in 1889 was replaced in 1974 with a two manual instrument purchased for �2,000 with funds raised from the village. This was an early John Compton instrument dating from 1909 and was one of the earliest attempts at an electric action. It was originally in the Congregational Church, Newton Burgoland, Leicestershire. It was rebuilt in 1936 and then moved to the the Methodist Church, Donnisthorpe in the same county. From there it came to Atworth. During its time in Atworth, various modifications and enhancements were made by Robin J Winn of Melksham, Wiltshire, including the provision of the final console, which had three manuals. 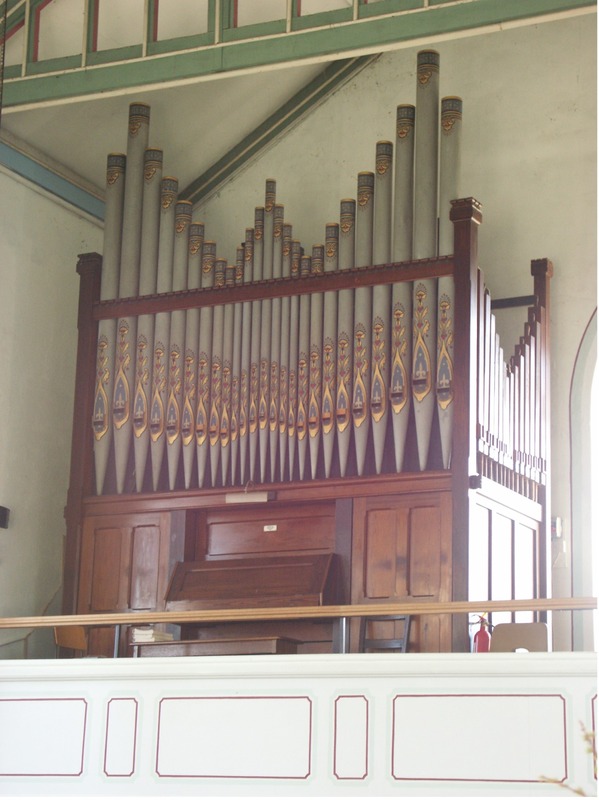 The 1909 Compton instrument was replaced in 1997 with the present instrument which was transferred from the Baptist Church, Cirencester, Gloucestershire. This instrument was built by Henry Speechly in 1892, and its purchase for Atworth was made possible by a generous contribution from Mrs and Mrs Bernard Cain, when they celebrated their 25th wedding anniversary and 25 years of living in Atworth. The original organ had two manuals, pedals, and 11 speaking stops. It had been renovated and its tonal characteristics substantially modified by the firm of AJ Price in 1926 - so as to bring its sound into line with the then current thinking. However, when it was overhauled in 1973 by Nicholson, it was returned to a state nearer to its original specification. You may like to read this short article: "Atworth's Little Gem". There are a number of ancient memorials belonging to the previous church. The finest of these at the south-east corner of the chancel records part of the Pawlett family history ending with Jane Brown of Cottles House, and whose education bequest was mentioned earlier. Amongst the 17th century memorials in the vestry is a plaque to Edward Tydcomb, surgeon who died in 1689 - a reminder that at one time, the Atworth community may have been sufficiently self contained to have its own doctor. At the south west corner of the nave in the choir vestry is a memorial to Daniel Gingwell, brewer, and his wife Ann, who died in 1813 and 1814 respectively; while in the middle of the north wall are two tablets to the memory of members of the Webb family who died form 1800 onwards. That name is still prominent in the village today. The loop was donated in 1998 in memory of Mrs Audrey Evans to commemorate her work with the deaf and hard of hearing. The system allows those with a T-switch on their hearing aid to receive a direct transmission form the microphones used in public worship. A 40 minute DVD has been produced, detailing the history and features of St. Michael's Church. The video shows and describes the nave, vestry, altar, gallery, the organ, tower, bells, and churchyard of the current building, as well as aspects of the first church construction of which was started in the year 1001. External features are shown, including the visible bounds of the 15th century (second) church whose tower is still present. The video is priced at �10, and all profits are donated towards the upkeep of the Henry Speechly pipe organ. The video can be purchased from the Churchwarden before or after any of the services in the church. Much of the St Michael's Church entry to the Atworth Village website was derived from the publication The Church of St Michael, Atworth - A Short History. This was written by WH Dowdeswell, and first published in 1985. In the publication Mr Dowdeswell acknowledges help from the then vicar, Revd GE Griffiths, the then secretary of the PCC Miss jean Philpott, church warden Mr WE Greenland. Professor Dowdsewell also quotes from Atworth - A Little History. Kenneth Spencer acknowledges not only the key source of Professor Dowdeswell's publication, but also that of David Webb, who kindly provided the photographs. To return to the Churches page, or to the Welcome Page, click on the "Churches" or the "Welcome Page" link on the scrollable side panel on the left.